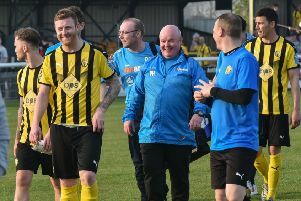 Leamington completed a satisfying opening eight days by taking their National League North points haul to seven a figure it took ten games to achieve last season, writes Paul Edwards. Manager Paul Holleran was forced into one change to his starting line-up from the victory over Boston in midweek, James Bowen replacing the injured Connor Gudger to make his full debut, while Chekaine Steele was involved for the first time, coming on for his debut in the latter stages of the game. Visitors Bradford arrived full of confidence, unbeaten in their opening two games despite losing prolific frontman Adam Boyes to league rivals Spennymoor during the summer, and they continued that in the opening exchanges. The Leamington defence had to block a couple of early threats before Jamie Hood hooked Shane Killock’s header away from goal. Jake Beesley had their best chance when he powered a header inches wide from a good position. Brakes slowly began to impose themselves on the game, Matty Stenson sending a clever stooping header wide of the target, and he came very close to opening the scoring when he met Kieran Dunbar’s right-wing corner with a thumping header, the ball crashing back of the bar. It was followed up by Junior English, who saw his shot blocked on the line before the ball was eventually scrambled clear. Both sides traded further off-target attempts, while Beesley scuffed a shot straight at Tony Breeden from a good position before Leamington got off the mark three minutes before half-time. Palming a cross away from danger and picking up the loose ball, Breeden set off on one of his trademark runs out of goal, moving past a Bradford attacker before trying to send Callum Gittings clear just past half-way. Ryan Toulson intercepted, however, but Stenson was on to the loose ball like a shot, accelerating into acres of space up the right wing and into the area before driving a low shot across keeper Steven Drench and into the net. Gittings has certainly had an eventful first week of the season, scoring on the opening day before getting sent off on Tuesday. He was back on the goal trail again two minutes into the second half, connecting sweetly on the edge of the box with a half-cleared corner and sending a powerful low first-time drive arrowing into the bottom corner. With a two-goal cushion Leamington were beginning to look comfortable and Stenson set about making things worse for Bradford on his own, twice setting off on powerful runs towards goal before being denied by desperate blocks. He was not to be denied, however, and just before the hour-mark he chased an intelligent pass from Connor Taylor into the area on the left, holding off Gianluca Havern before turning sharply to thunder the ball into the far corner off the hand of Drench. Callum Gittings, scorer of Brakes' second, is upended in midfield. Brakes fans have been fortunate enough to see some quality strikers in their colours over the years and even after only three games there is little doubt that this number nine is going to be right up there with the best of them. Bradford were not quite dead and buried, though, a header from a right-wing corner appearing to strike a green shirt on the line, while Hood was well placed once more to hack another effort away from danger. Stenson almost created a glorious hat-trick goal for himself when he chased the ball almost to the touchline at the Harbury Lane End and with a defender at his back somehow managed to hook a powerful shot across goal and inches wide of the far post. The ovation he received when replaced by home debutant Anthony Dwyer with 15 minutes to go was fully deserved. Joe Magunda came close to a fourth for Brakes when he headed Dunbar’s right-wing corner just wide, while Dwyer curled a well-struck free-kick into the arms of Drench as the game entered its final stages. However, Leamington switched off in injury time and very nearly saw the points slip from their grasp. Killock nodded in Jamie Spencer’s cross at the far post for what looked like a consolation but within 60 seconds the alarm bells were well and truly ringing as substitute Oli Johnson slammed in a second from a delightful ball in from Ben McKenna. Brakes were clearly rattled but to their credit they composed themselves in what remained of injury time and made the game safe when Dwyer picked up a ball out of defence on the right between two Bradford defenders before driving into the box and unleashing a low drive into the far corner to open his account in Gold and Black. Brakes: Tony Breeden, Junior English, James Bowen, Joe Clarke, Jamie Hood, James Mace, Kieran Dunbar, Callum Gittings, Matt Stenson (Anthony Dwyer, 75), Jack Edwards (Joe Magunda, 69), Connor Taylor (Chekaine Steele, 80). Subs not used: Kieran Morris, Ahmed Obeng. Bradford: Steven Drench, Ryan Toulson (Oli Johnson, 46), Ross Mark, Nicky Wroe (Jamie Spencer, 58), Shane Killock, Gianluca Havern, Ben McKenna, Conor Branson, Jake Beesley, Chris Dawson Adam Nowakowski, 61) Nicky Clee. Subs not used: Jack Atkinson, Danny Boshell.